Good Stuff NW: Salad Smackdown: Cauliflower and Grain FTW! It's like I was walking up a steep trail in the woods and suddenly came across a pristine pool underneath a sparkling waterfall. Hot and sweaty from the exertion, what could I do but dive in? Some recipes are like that, in that they provide an jumping-off place for an unexpected and often refreshing experience. Jim Dixon's cauliflower with Meyer lemon relish, which chef Alice Waters (of Chez Panisse fame) based on an Italian gremolata, was like that for me. I'd made it several times to raves here at our house, as well as when I took it as a side dish to friend's homes. Its lemony tingle is fantastic with Meyer lemons when they're in season, but regular lemons serve almost as well. And preserved lemon, minced into tiny shards, takes it to another level with their zesty, salty tang. It was the preserved lemon version that first had me pondering adding grain to the mix, so the next time I added frikeh, the smoky, parched wheat from Ayers Creek Farm that had been cooked to toothy perfection. Dave was smoking a ten-pound behemoth of a brisket for Memorial Day, so I thought that the cauliflower with frikeh would add an additional smoky note to the ensemble (which included my mother's potato salad and grilled asparagus). There happened to be chive blossoms going nuts in the garden, so a few of those were plucked and sprinkled about. While I feel like this particular recipe has come to a nice resting point, I'd love to hear if you discover a sparkling pool hidden in its depths. Bring a medium pot of water to boil. Add the grain and reduce heat to simmer. Cook for about 30 minutes until al dente (or to your liking) but definitely don't let it get mushy. Drain in a colander and run cold water through it to stop the cooking and cool it quickly. Drop a whole head of cauliflower into a pot of salted boiling water. Pull it out after 3 minutes and let it cool. 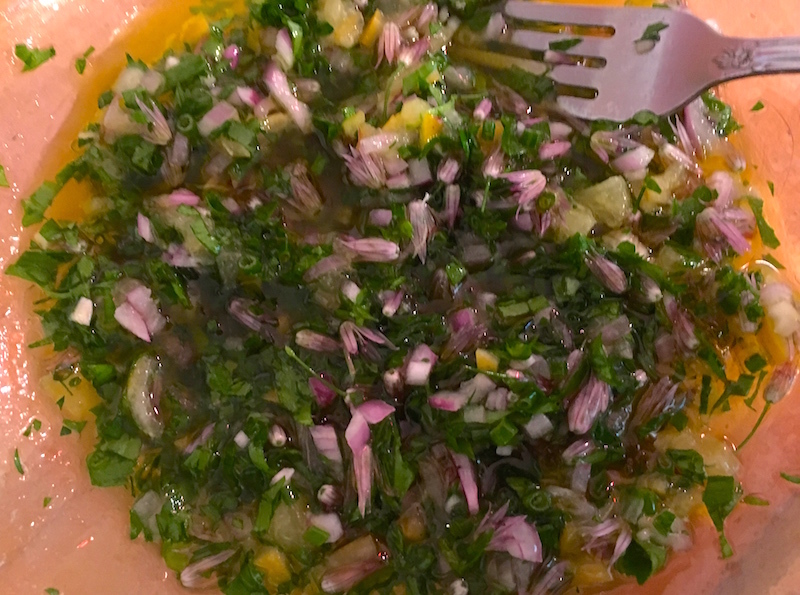 Make the relish by putting the minced lemon into a large salad bowl and combining with the shallot, parsley, chives, vinegar and olive oil. Let this sit for a few minutes while you chop the cauliflower into small florets (use the core, too, just chop it into smaller pieces). 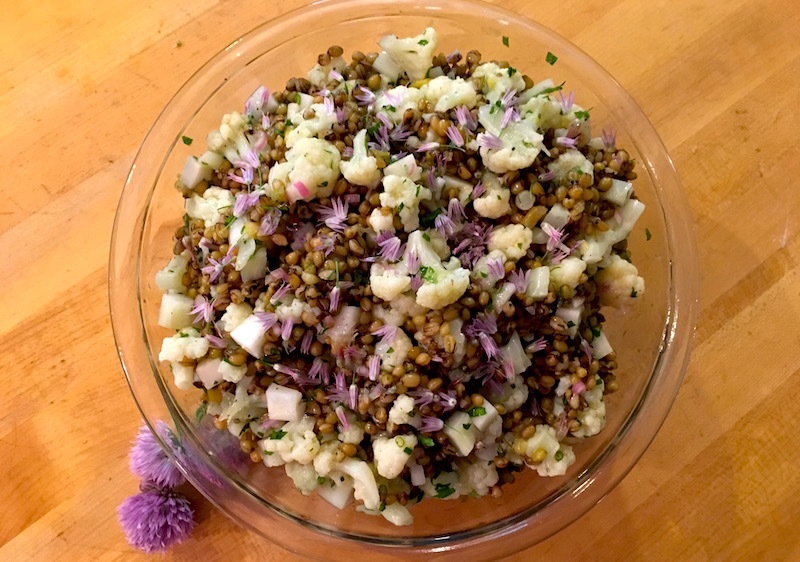 Toss the cauliflower and the grain with the relish, adding salt to taste. Garnish with chive blossoms, if using. Serve cold or at room temperature. See the rest of the Salad Smackdown series—winners all!